This weekend we met up with our friends in their campervan, Daisy, at Dodwell Park campsite near Stratford upon Avon. It was a perfect, fun-packed weekend with eating and drinking in the evenings and a lovely walk along the river into Stratford upon Avon during the day on Saturday. Stratford upon Avon is a lovely town so it's a real shame neither of its two campsites are particularly nice. Last year we stayed at Riverside caravan park with its endless regulations and long lists of what is and isn't acceptable. One of the more bizarre rules is that you cannot put up a windbreak, but there any many more things you might expect on a campsite that aren't allowed. The final straw was when the on-site bar told us they didn't serve real ale. We visited Karma Farm eco campsite this weekend. It was our third visit to this back-to-basics campsite near to Ely in Cambridgeshire. We love it for its simplicity and rural countryside location. The 20 per cent discount on site fees for returning guests is a great idea and lovely reward for loyalty - we'll certainly be back next year. We spent a relaxing weekend exploring the local countryside by bike, particularly enjoying a riverside walk in nearby Mildenhall and a few pub stops along the way. We tried something novel to eat when we whipped up stinging nettle pesto to go with spaghetti. I'm in no hurry to make it again! After three glorious sunny days at Domaine Les Gandins in the Auvergne we packed up to drive west, following the sun to Ile d'Oleron on France's west coast. One of the benefits of holidaying with your campervan is the ability to plan your trips around the weather. The forecast had been correct in predicting the sun and it was to rain shortly after our departure. However the expected storms had already passed over the west coast and so we booked, just a day head, into Huttopia Les Pins. This was our fourth trip to Ile d'Oleron in three years. On the previous occasions we've stayed at Huttopia Chenes Verts and we'd have liked to have stayed there this time but unfortunately the site wasn't yet open for the season. 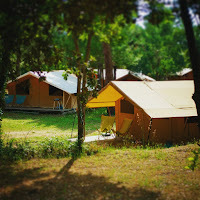 Huttopia Les Pins is at the southern tip of the island and had been open just a few days prior to our arrival. It was 9.30am when I woke on our first morning at Domaine Les Gandins. I was cross with myself for sleeping so late - we'd got a day of cycling planned. I was equally cross with Tony who continued sleeping after I'd got up. I didn't make him any coffee as punishment. I sat under a tree at the far side of the campsite in the morning sun as Cleopatra was in the shade of the trees first thing. I sipped my coffee and listened to the birds. We were the only campers, for the first day anyhow. Tony finally got up at 10am, saw me with my coffee mug and looked for his. Seeing it was unused he made his own before joining me under the tree. My grumpiness was quickly forgotten when soon after we were on our bikes cycling to the old town of Charroux, a 40 minute ride with a little getting off and pushing on my part.